U.S. President Donald Trump sulked and scowled his way through ceremonies commemorating the 100th anniversary of the end of World War I this week, said Guillaume Errard in Le Figaro (France). Before he even disembarked in France, Trump had fired off an angry tweet lambasting his host, French President Emmanuel Macron, for saying Europe needed its own army. At a reception with Macron the following morning, the U.S. president insisted the two were still friends, “but the stage had been set.” Skipping an appearance to honor U.S. war dead because of a little rain, Trump “had nothing on his schedule” all afternoon until a dinner gala at the Musée d’Orsay, and even there, he sneaked in through the back, avoiding the other guests. The next day, rather than walk in the rain down the Champs-Élysées with some 60 other world leaders, Trump kept dry and aloof by being driven to the Arc de Triomphe for the ceremony. 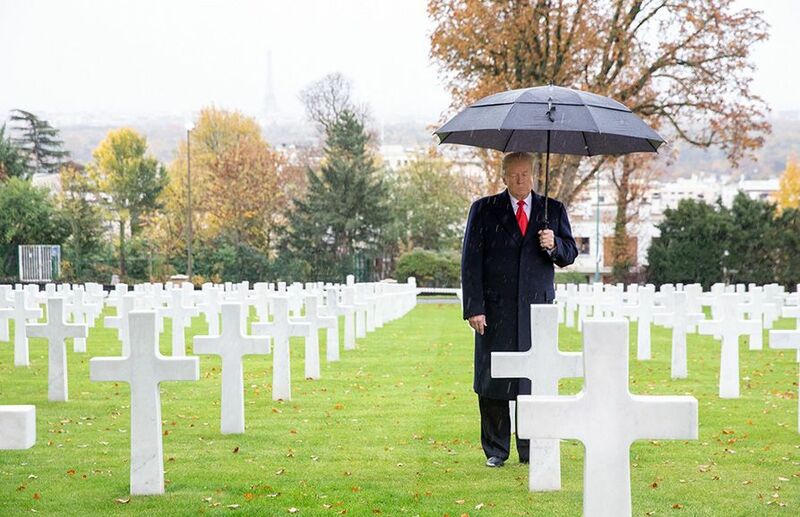 As a final “swipe at Macron,” he skipped the French president’s Peace Forum and went to a cemetery for American soldiers instead, calling that outing his best moment of the trip. This is yet another sign that the U.S. and European Union are headed for “divorce,” said Sylvie Kaufmann in Le Monde (France). Trump has already pulled the U.S. out of the Paris climate treaty and the Iran nuclear deal—two pacts European leaders worked hard on—and he never misses a chance to bash NATO members for failing to spend enough on their militaries. Most distressing in this breakup, though, is the realization that Trump “no longer shares Europe’s values”: human rights, democracy, and a free press. And it’s not just Trump—it’s the Americans who elected him, said Stefan Kornelius in Süddeutsche Zeitung (Germany). This is a president “who has unleashed the mob, who lies and instigates on a mission of destruction.” His America “would rather call a few thousand Latino refugees an invasion than allow the FBI to investigate the thousands of homegrown, violent right-wing extremists and anti-Semites.” America won’t be a partner for Europe until it exorcises its demons.